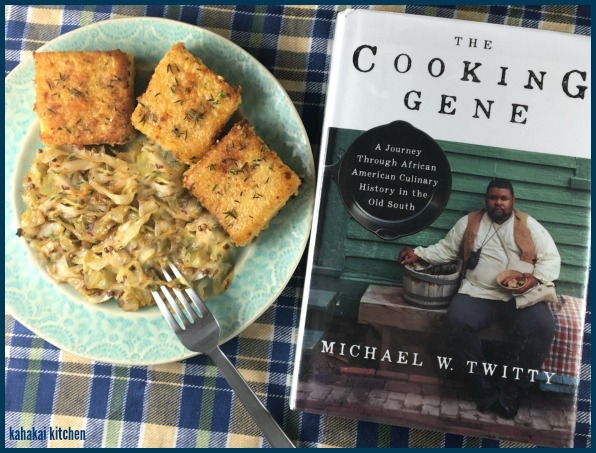 It's time for the roundup of Cook the Books' Club October-November 2018 edition for which we read the The Cooking Gene by Michael Twitty. For each contribution (given in order of publication), I will give you the official information (author, blog name and post title) and a quote from it — a taste that will entice you to follow the link and read the details of how the reading inspired the cooking. Make yourself comfortable, then follow me on a historical literary / culinary journey. "Michael Twitty... says that orchard fruit was a staple of the food that was rationed out for slaves along with molasses, coffee, flour and game hunted on plantation grounds. In addition, seasonal produce from personal gardens made up the bulk of a slave’s diet... 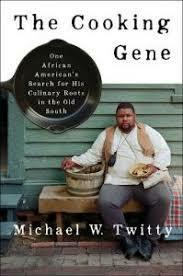 I had the opportunity to hear Twitty speak at the Smithsonian’s recent Food History Weekend... He also spoke at length about Southern food and Soul food, noting that Southern food wouldn’t be Southern food without Soul food - not the other way around, that Soul food equals memory food and that Soul derives not just from people of African descent... For the apple crumble I prepared for this post, I followed Twitty’s advice to always select multiple varieties for a perfect mix of texture, taste of tart and taste of sweet." The book "is much more than that, being also personal history, a memoir of the author and his family, from the time of their arrival as slaves to the present day... It is the story of their sojourn in America, from enslaved times to now. Though, just my opinion, it would be both interesting and enlightening to take the story back to when that slavery actually began. The origins... From Twitty's book, I was inspired to make his BBQ Mop sauce for a batch of ribs, cooked in my pressure cooker, which gets them just to the right tenderness, perfection when you afterwards slather them with the sauce and caramelize in the oven! 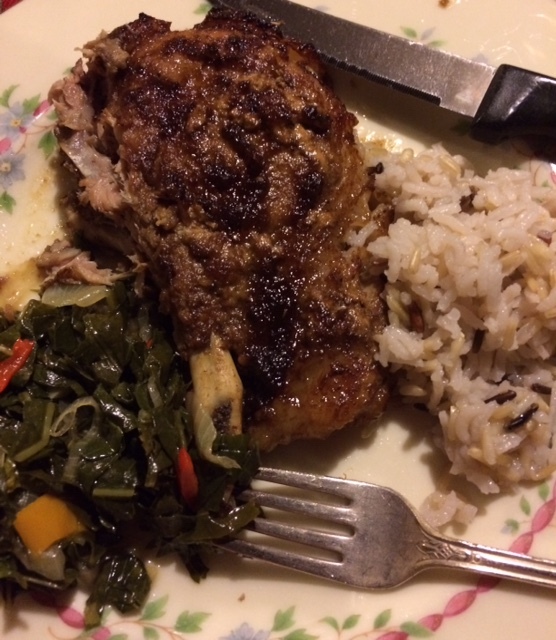 Served with Sautéed Collard Greens and rice. I meant to make spoon bread, but got pushed for time and energy." 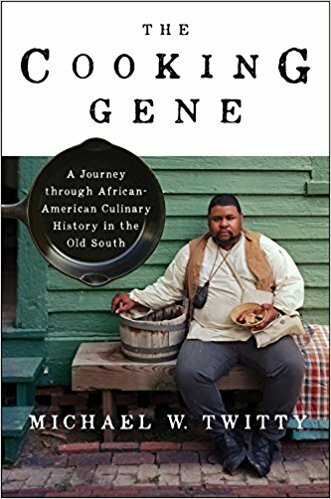 "Even before reading the book, I knew Twitty is a great story teller, whether he talks about a specific dish or is inhabiting the lives of his enslaved ancestors. I understand his need to know, his stubborn following all the threads that tie his life to those of his forebears. It as a special kind of religious pilgrimage. Whatever your specific interests, you will find the book fascinating, as it weaves foodways into the quilt of people's migration, mostly (though not all) forced... I decided to mirror the woven stories and make something that would represent my own journey... A special connection to the book is provided by fagiolina del (Lago) Trasimeno, a legume typical of my home region of Umbria, which is a cultivar of cowpea, Vigna unguiculata, closely related to black-eyed peas, one of the crops brought from Africa to America on slave ships." "I applaud Twitty in his journey and his suggestion that perhaps healing our nation may come from understanding the tribulations and terrors that others have experienced along with the merging of food into one shared experience. Since I was short on time (with Thanksgiving and all of that) and I am constantly on the lookout for possible gifts from the kitchen this time of year, I decided to make Twitty’s Kitchen Pepper... This is a great spice mix. As I savored the grilled pork chop sprinkled with these warming flavors, I also was struck by just how much blood and enslaved toil may have gone into the history of the spices in this recipe. An entire island was conquered and enslaved due to the high value of nutmeg. How many enslaved people died in the delivery of some of these spices?" "A book that was both riveting and very difficult to read without flinching. Go ahead and flinch - our history is extremely uncomfortable - and then keep reading. You will know much more when you finish this book than you knew before you started, and you'll find yourself thinking about it long after you've put it down... 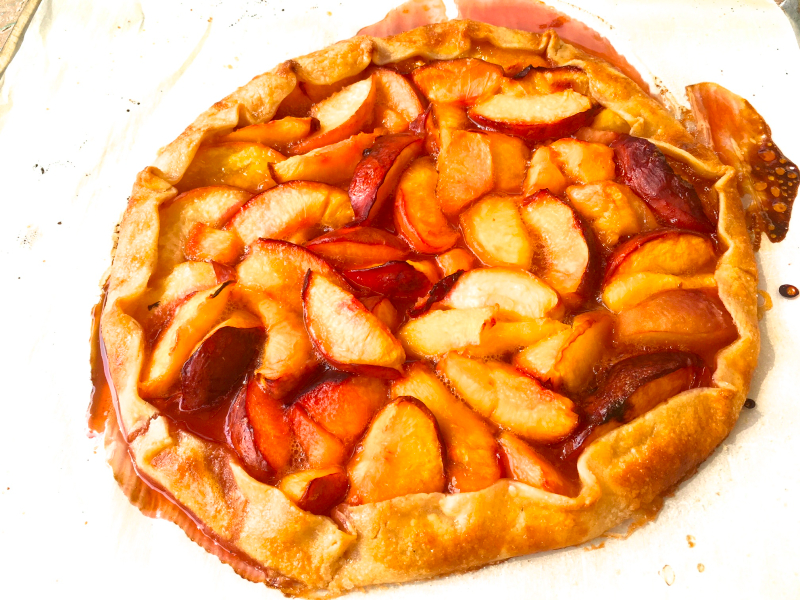 I was totally overwhelmed when it came to choosing what to cook as my inspiration from it. SO. MANY. POSSIBILITIES... I decided to take my inspiration from a passage about time spent visiting his Southern relatives as a young man. In The Cooking Gene, this story includes a passage about persimmons, and it occurred to me that I had never had a persimmon... This time of year is just an excellent time for sweet quickbreads, so that's what I've done here - I have no idea if this is anything at all like Michael Twitty's grandmother's, but we enjoyed it quite a bit." She had a difficult time getting through the book: "There are so many avenues that I thought Twitty would take this this book... delve into the social aspects and dynamics of food in the African American community... look at how food defines a regional identity. He didn't... And I think I could have gotten over my disappointments in what I expected to read had I enjoyed his writing style. But, sadly, I didn't... I wanted to love this book, but it wasn't a winner for me. 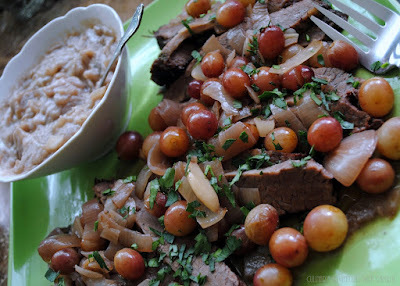 Still, I was inspired to create a Jewish-inspired dish as Twitty converted to Judaism in his early 20s. There's not much of a tie to Southern cuisine with this, but I had beef brisket on my to-do list... Also, I wanted to make something with fresh horseradish. 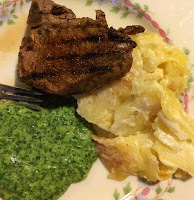 So, I made a gremolata with freshly grated horseradish." 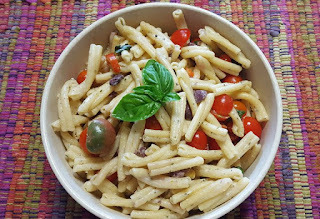 "At moments he made hungry, next making me squirm uncomfortably at the uglier moments of our not-so-distant history, then teaching me something new about food before getting me chuckling over his family moments--that while completely different from my own cultural upbringing, often ring with complete familiarity. I love books that give me information--especially when it is related to the history and origins of food and Twitty does it in such an engaging way that had me completely caught up in his journey, and even though I dipped into the book in bits and pieces over the past several weeks, he made the 400+ pages easy to digest (pun intended)." 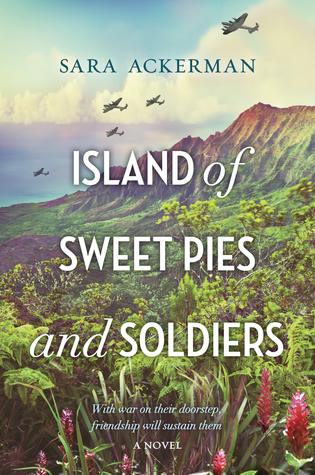 And now, I’ll turn things over to Deb of Kahakai Kitchen who is hosting the December-January edition in which we are reading the novel Island of Sweet Pies and Soldiers by Sara Ackerman. I have long wanted to host a Hawaii-set book for Cook the Books and so I’m excited to pick this historical fiction set during WWII on the Big Island. Author Sara Ackerman was born and raised in Hawaii and studied journalism, earning graduate degrees in psychology and Oriental medicine. When she's not writing or practicing acupuncture, you'll find her in the mountains or in the ocean. 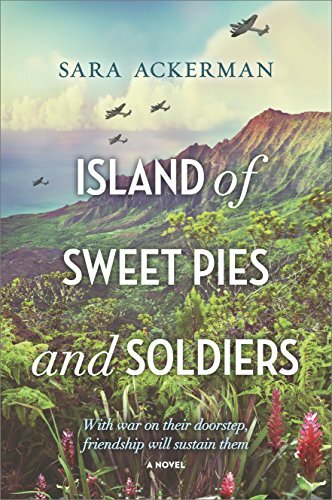 Here are links to her website and to her Instagram account where she posts lovely photos of Hawaii and books. As I am currently at number 184 on the library list, and have no personal reportage to present, we will go with clips from the Publisher Weekly Review and the NY Times. Needless to say, the novel has plenty of people eating interesting food. 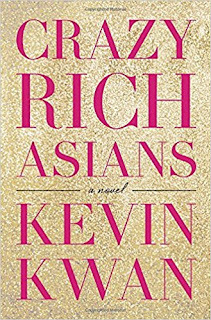 Kwan's debut novel is a fun, over-the-top romp through the unbelievable world of the Asian jet set, where anything from this season is already passe and one's pedigree is everything. When Rachel Chu's boyfriend, Nick Young, invites her home to Singapore for the summer, she doesn't realize how much gossip she's generated among Asian socialites around the world. To Rachel, Nick is a sweet, intelligent history professor-and the first man she's imagined marrying. To the Asian billionaire set, he's the gorgeous heir apparent to one of China's most "staggeringly rich" and well-established families who virtually control the country's commerce with their ancient fortunes. As soon as she steps off the plane, Rachel is ushered into the opulent world of castle-like estates and mind-boggling luxury. 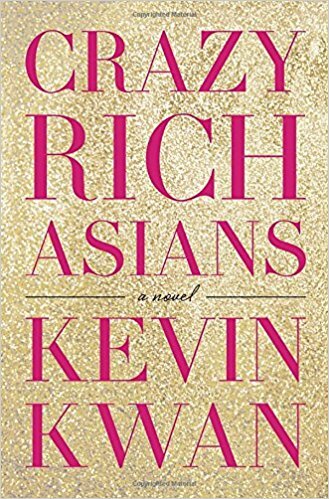 As if the shock of realizing the scale of Nick's wealth is not enough, she must also contend with a troupe of cruel socialites who would absolutely die before they let Singapore's most eligible bachelor get snapped up by a no-name "ABC" (American-born Chinese). There is also Nick's family: his imposing mother, Eleanor, who has exact ideas about who Nick should be dating; his beautiful cousin Astrid, who the younger girls dub "the Goddess" for her stunning fashion sense (she was "the first to pair a vintage Saint Laurent Le Smoking jacket with three-dollar batik shorts"); and Nick's cousin, the flamboyant Oliver, who helps Rachel navigate this strange new world. A witty tongue-in-cheek frolic about what it means to be from really old money and what it's like to be crazy rich. Mr. Kwan knows how to deliver guilty pleasures. He keeps the repartee nicely outrageous, the excess wretched and the details wickedly delectable. Who knew that an Asian menu might boast of “Giant South Sea Scallop Consommé With Washington State Ginseng Vapors and Black Mushrooms?” (“Go figure,” writes Mr. Kwan, in a footnote about why the ginseng is imported.) Who knew that an Asian socialite might include Save the Shahtoosh among her favored fashionable causes? This should be a fun and food inspiring selection. I devoured this book in record time and I am confident the CTB members will as well. (Lee was an English major and I think it’s evident in his writing and style.) Lee travels on his quest to Louisiana, Massachusetts, Brooklyn, Michigan, Florida, Appalachia (with Ronni Lundy), the Mississippi Delta, Alabama, Connecticut, Washington, Texas, New Jersey, Kentucky, Wisconsin, and Illinois. I’ve listed the states/regions he visits here, but Lee is journeying to each area for specific cuisines in specific cities (like the slaw dog and or food of specific cultures). 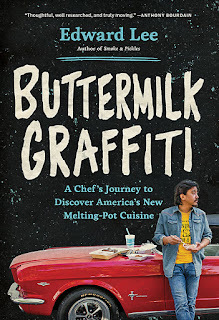 Edward Lee is the author of Smoke & Pickles and Buttermilk Graffiti. He is the chef/owner/culinary director of numerous restaurants in Kentucky, Maryland, and D.C.. I first became aware of Lee through his role in the Emmy Award-winning series The Mind of a Chef. 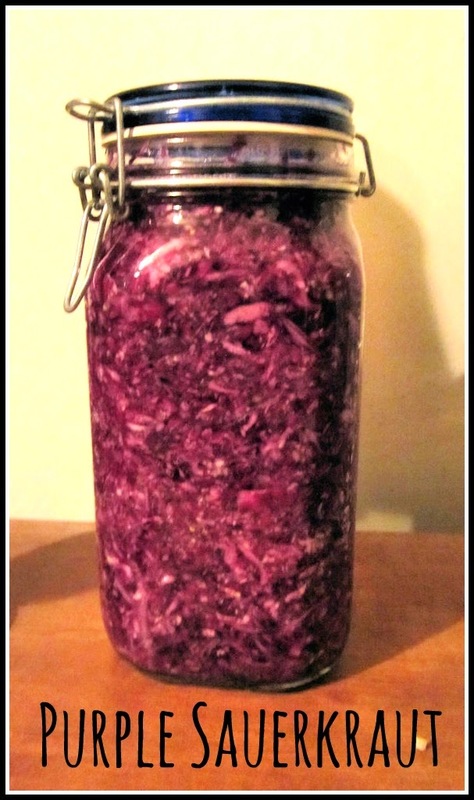 Fermented, a feature-length documentary is another recent project (2017). He splits his time between Louisville, KY and Washington, DC. This book was suggested to me recently and I am excited to read it with you all and see how the reading inspires us. Deadline for contributing your post: Wednesday, July 31, 2019. 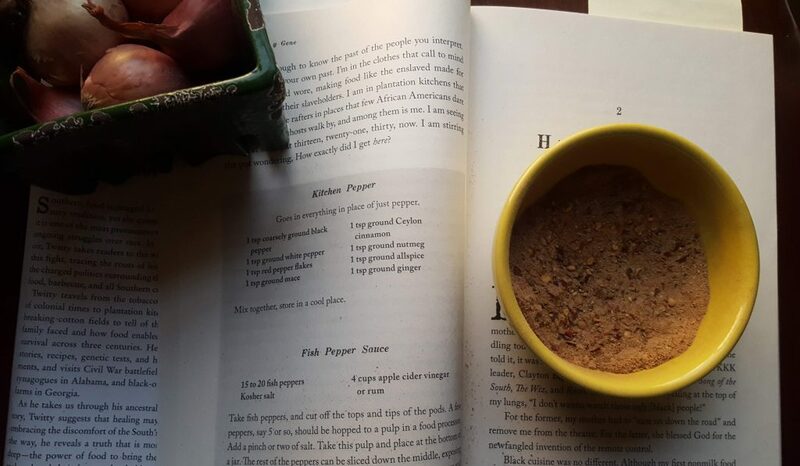 Remember that membership in our book club is open to anyone and we hope you will join us by reading these selections and creating inspired recipes. For more information about participating, click here. As always, specific announcement posts can be found at Cook the Books as the current year ends and the new one marches on. I was glad to see The Cooking Gene, A Journey Through African American Culinary History in the Old South by Michael Twitty mentioned on our suggestion page, as it was already on my to-be-reading list. I have had the pleasure to meet Michael Twitty in person and listen to him: he is an engaging speaker. I am thrilled to read his book and share the experience with others. The Cooking Gene has won the 2018 James Beard Foundation's Book Of The Year Award. A quote from Twitty can be seen on the walls of the Sweet Home Café at the Smithsonian National Museum of African American History and Culture (you can see it and read the details in this post). This selection brings to a close the current set of four: be on the lookout for a post where we announce the next four selections. 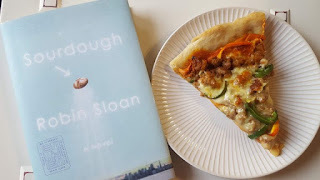 I had to host Sourdough for this round if not only for Sheehan's goofily spot-on review. That leads me to the following question: Do you like quirky? I hope so because the August/September round is quirky galore! 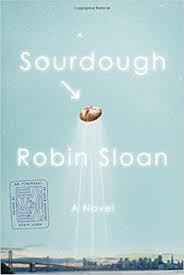 Sourdough by Robin Sloan starts out, honestly, very believable. The plot revolves around a young coder, robots, food, sourdough (obviously), farmers markets, geeky foodies, and mysterious strangers. Sloan riffs on the whole foodie angle with a plot that borders on a sci-fi mystery. OK, if you are not intrigued and pulled in by now, I don't know what to do. As the end of summer nears, pick up this book for your final day on the beach or your last lazy day. You'll be glad you did. Robin Sloan is also the author of Mr. Penumbra’s 24‑Hour Bookstore (which I am currently devouring---it's kind of an upbeat Club Dumas). 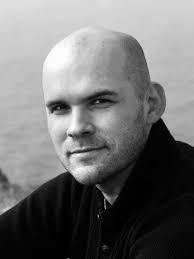 Robin Sloan grew up near Detroit and went to school at Michigan State, where he studied economics and co-founded a literary magazine called Oats. After college, he worked at the intersection of media and technology, first at the Poynter (pronunciation: pointer) Institute in St. Petersburg, Florida, and then at Current TV and Twitter, both in San Francisco. His first novel, Mr. Penumbra’s 24-Hour Bookstore, was a New York Times Best Seller, translated into more than twenty languages. George Saunders called the book “a tour-de-force” and Robin kindly requests that no one say anything else about any of his writing, ever. We are done here. With his partner Kathryn Tomajan (pronunciation: TOM-uh-jun), Robin manages a leased three-acre grove of olive trees in the San Francisco Bay Area. Their first batch of extra virgin olive oil will be available in 2018. 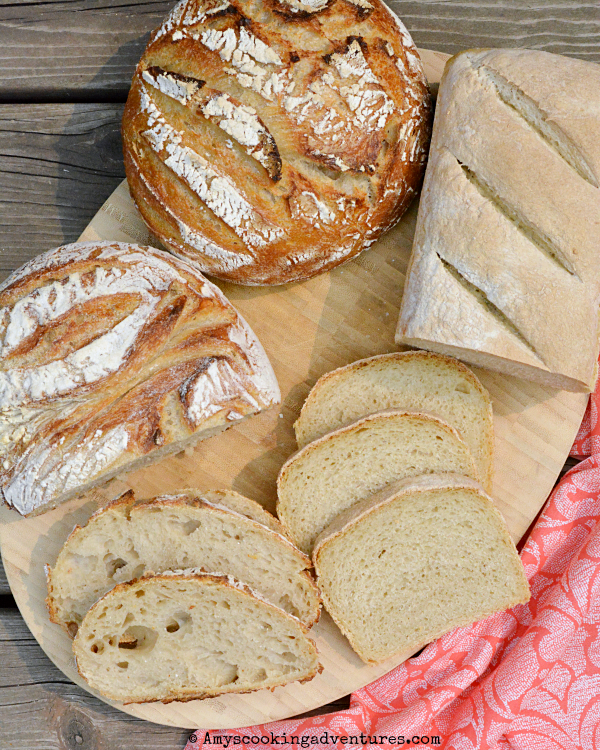 I do hope you join in the fun and pick up Sourdough for the August/September round. The deadline for Sourdough is September 30, 2018. Anyone can join in by reading the current selection, preparing a dish inspired by its contents, and writing about it. Let me know when your entry post is up by commenting on this post and/or sending me an email at eliotseats@gmail.com. P.S. I hope there are lots of yeasty things to post up for this round. 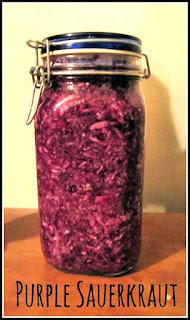 As for me, I have killed two sourdough starters thus far. Once again we at Cook the Books Club are aligned at the corral gate, with a rousing Roundup of all the participants in our selection, Garlic and Sapphires by Ruth Reichl. And, what an adventuresome ride it's been! Reichl is such a gifted writer, unusually able to not only distinguish, but to vividly communicate the subtle nuances of flavor in food, distinguishing obscure tastes and seasonings. This facility is combined here with her wacky sense of humor, and ability to illuminate personalities, and, adopt them when necessary in the course of her work! It's been such fun, and the appreciation seems to have been almost unanimous. Please take the time to read and enjoy all of the posts. I've included just a short snippet from each to whet your appetites. Thanks so much everyone for joining in. 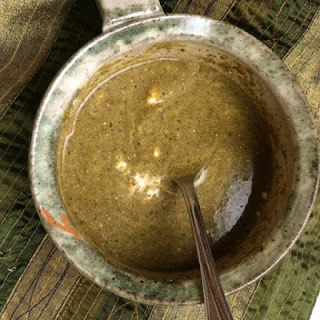 First up was Camilla of Culinary Adventures with Camilla, who made us a tasty batch of Afghani Scallion Dumplings. She enjoyed reading about the various disguises Reichl used in the course of her job as a critic for the NY Times, and writes: "And when I write 'exploits' I mean fully costumed escapades in which Reichl adopted different personae in order to get an unbiased take on a restaurant." And sums up by saying: "Needless to say, I thoroughly enjoyed this book. 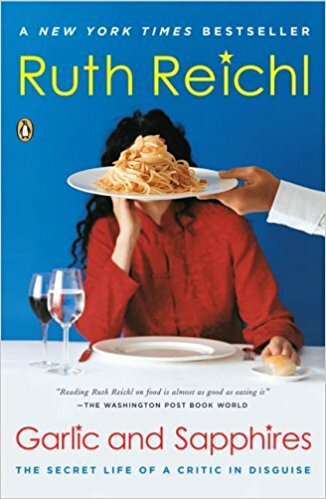 Reichl is not only a culinary powerhouse, but she has an appealing prose that makes her vibrant personality shine." Next in was Debra of Eliot's Eats who made us a lovely dish of Strozzapreti with Tomatoes, Olives and Herbed Goat Cheese, Oh Yum! She said: "I have every single one of Reichl’s books along with the aforementioned Gourmet Today and the huge yellow The Gourmet Cookbook. 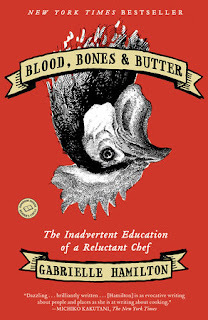 If I were ever to do a “Julie/Julia” type project, I would cook my way through every single one of her books. Love her! 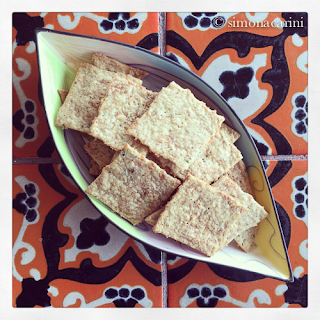 ... one of our true food treasures." Wendy of A Day in the Life on the Farm came to the party with sassy, tangy Roasted Rhubarb. She says that she "was extremely excited when another of her (Ruth's) memoirs was chosen this time. Did I love it as much as the previous mentioned memoir? I daresay, I loved it even more. This is a laugh out loud, very interesting picture of what life is like to be a restaurant critic. It had never occurred to me that if you were a restaurant critic you needed to be able to dine in restaurants without being recognized. Otherwise, you will only know the service and food you are given as a celebrity instead of a normal Joe, like you and me." Claudia, (moi)of Honey from Rock, prepared some of Ruth's Scalloped Potatoes for the blog party, served with salmon and a salad one night, and the next with grilled steak and some of her pureed watercress. I mentioned that "I am a woman who goes through life seeing the comic absurdity at play all around me. Perhaps why I so appreciate her writing. The disguises she literally got into here! And, I absolutely love her many transfixing culinary descriptions". 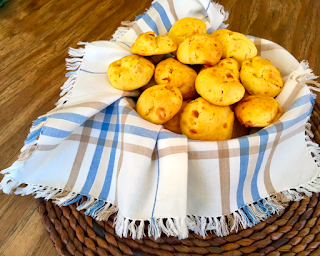 Cathy of Delaware Girl Eats gave us yummy Gougeres - Delicious Cheese Puffs by any namet! She commented: "Ah but the food. 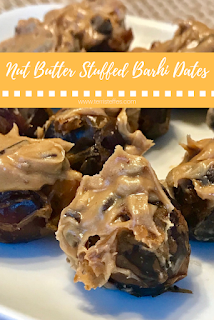 What Brenda, Molly, Chloe, Emily and all the other Reichl ladies ate was mouthwatering and her descriptions of those delicious courses were so enticing that I wished fervently for the opportunity to taste just one or two of the dishes she savored." 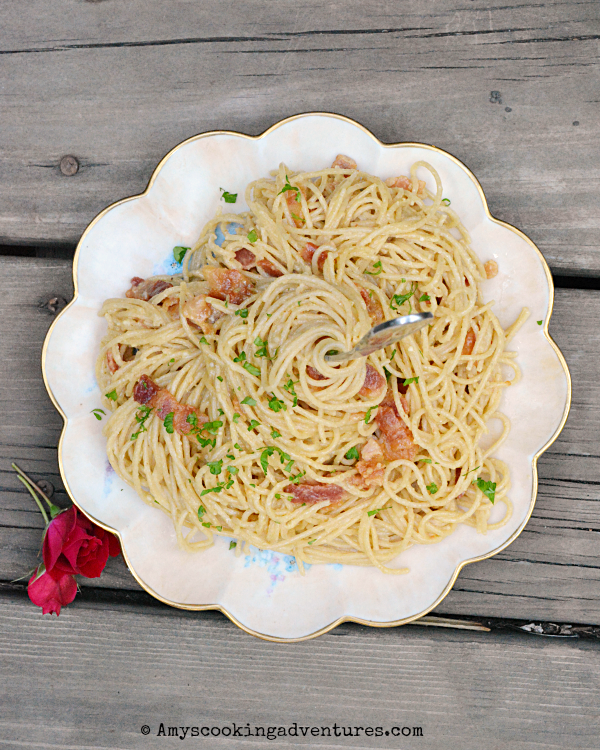 From Amy of Amy's Cooking adventures, we have tasty Pasta Carbonara! Amy said: "I read one of Reichl’s previous memoirs for CtBC a couple years ago (I made a twist on French Onion Soup and it was delicious) and I enjoyed reading about her then – this time I loved it even more. It was fascinating to read about Reichl’s time as the Times Food Critic! I loved reading about her disguises and that she included some of her reviews and recipes to go along with them. Lynda, of Reviews, Chews & How-Tos joined our party with a "simple" Celebration meal, featuring Reichl's Garlic Roast Lamb. 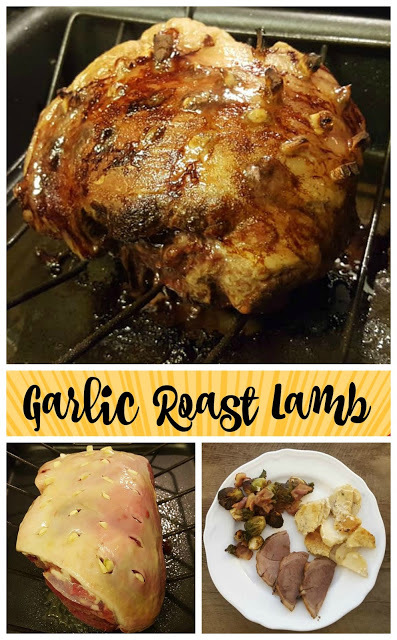 She commented that: " By far the hardest part of this challenge was trying to narrow down what to make, as almost every recipe and a great many of the passing references to food stirred a longing to make that... and that... and that! For me, that is what a food memoir should do - it should create a sense of desire and longing to commune with food and the many ways of relating to one another through the preparation and eating of food." Tina of Novel Meals brought some delicious home cooking to the event - Roast Chicken with Potatoes, Onions and Garlic. Yum! She said: "This is a second time around with this book but it was my first Ruth Reichl book several years back. I liked it quite a bit; it’s always good to revisit an excellent foodie book. I’m usually attracted to books about food and restaurants, behind the scenes stuff and recipes included are a bonus." 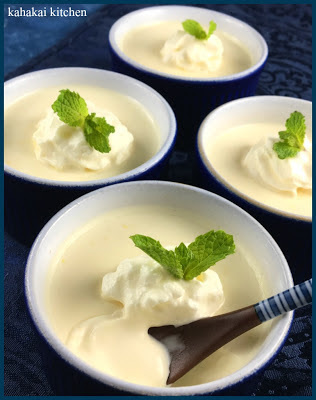 Fellow Hawaiian blogger, Deb of Kahakai Kitchen came in with dessert, a luscious looking Lemon Panna Cotta, that I've absolutely got to try! 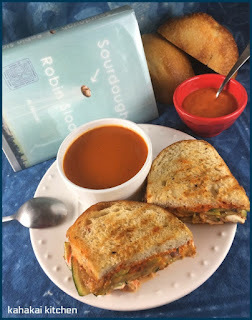 She says: "Reichl's food writing--whether her books, her blog, her work at the now-defunct Gourmet Magazine (Sniff...sniff... has it really been almost a decade since it folded?! So sad...), never fails to make me hungry and happy. The descriptive passages in Garlic and Sapphires make me feel like I am hanging out with her, exploring the nineties New York restaurant scene. A very happy revisit." Just under the wire, Simona of Briciole came in with her creative round Stuffed Zucchini, a dish I'd like to make myself, though I've never seen those little potbellied vegetables in our markets. Maybe one day. She commented: "While reading the book, the word "stuffed" kept coming to mind, blinking like a neon sign. 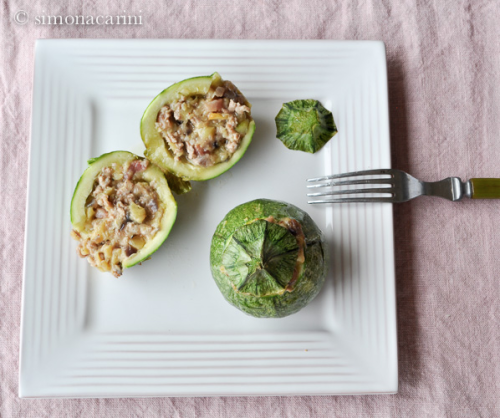 I took that as my inspiration and was aided in my recipe development by the appearance at the farmers' market of beautiful round zucchini that just begged to be stuffed. I think we're all looking forward to the August/September selection: Sourdough by Robin Sloan (September 2017), hosted by Debra of Eliot's Eats. 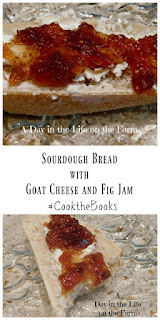 Get yourself a copy at the library, bookstore or online and join in the fun by reading, cooking up a dish inspired by the book, and posting about it. For newcomers, there's more about us and a how-to at our Guidelines page. Thanks again to everyone who participated.